2010: Team's starting right tackle. Anchors right side of offensive line that is ranks fourth in NFL in Sacks per Pass Play (3.97 pct. ), giving up just 20 sacks this year on 504 pass plays. * Started in season opener at Chicago (9/12). * Part of an offensive line against Philadelphia (9/19) that allowed 115 yards rushing, including 78 and 2 touchdowns from rookie Jahvid Best. * Started at right tackle and was part of an offensive line unit that allowed just 1 sack on 33 pass plays in the Lions 44-6 win vs. St. Louis. * In 37-25 victory over Washington (10/31), starting right tackle of offensive line that allowed one sack on 46 pass plays. * Left game early with knee injury against New England (11/25). 2009: Team's starting right tackle. * Started at right tackle in season opener at New Orleans (9/13). * Started at right tackle vs. Minnesota (9/20) and was part of an offensive line that alllowed 129 rushing yards on 34 carries. * Inactive with a shoulder injury vs. Pittsburgh (10/11). 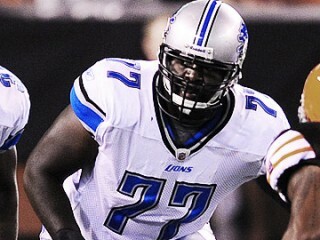 2008: Played in all 16 games with 13 starts, solidifying the Lions right tackle position. * Saw first game action of professional career at Atlanta (9/7). * Got playing time at right tackle in home opener against Green Bay (9/14). * Got first start of professional career at San Francisco (9/21). * Anchored right side of offensive line that led way for the team’s season-high 130 yards rushing on the ground and rookie RB Kevin Smith’s first career 100-yard game (112 yards). * Matched up through the game at Indianapolis (12/14) against DE Robert Mathis and helped the offensive line protect QB Dan Orlovsky as they allowed zero sacks on the day. After starting 37 consecutive games at right tackle for the Eagles, Cherilus moved to the demanding left tackle position his senior year becoming an instrumental part of an offense that ranked seventh in the nation with an average of 323.9 aerial yards per game. * As the recipient of the team’s Unsung Hero Award in 2007, he also garnered All-Atlantic Coast Conference second-team honors and served as a team captain. * Started all 13 games at right tackle as a sophomore and delivered 53 knockdown blocks and helped the Eagles to lead the Atlantic Coast Conference in total offense, averaging 387.75 yards per game. * Was the only redshirt freshman to start on BC’s offensive line in 2004, helping the team average 385.4 yards per game in total offense. * Closed out his career with 51 consecutive starts for the Eagles, setting a school record. Attended Somerville (Mass.) High School where he was a Boston Globe and Boston Herald All-Scholastic selection as a senior. * Played tackle on both sides of the ball. * Named to Tom Lemming’s All-American team in 2002, the same season that he captured All-State accolades from the Massachusetts State Coaches Association. * Excelled on Somerville’s basketball as a power forward and center. * Performed in the shot put for the track team. * Communications major, who graduated in the spring of 2007 from the College of Arts and Sciences. * Came to the United States from Haiti at age 14 and became a U.S. citizen shortly after. * Son of Morisena Exilus and Jenel Cherilus. * Born Gosder Cherilus on June 28, 1984 in Haiti and resides in Somerville, Massachusetts. View the full website biography of Gosder Cherilus.